On the 23rd September we, a collective of Glasgow tenants entered the empty property at 4 Queens Crescent. We are not affiliated with any one political organisation or ideology; instead, we are united in our common struggle in support of housing as a fundamental human right. We did not break in - the external and internal doors were already open after the landlord Harry Singh illegally removed the locks to intimidate and evict his tenants. The collective secured the property and held it for six days to highlight Singh’s unacceptable treatment of his tenants and to protest the wider corrupt and unequal housing system. Two tenants died in 1999 in a house fire at a property owned by Singh as the property was not equipped with working fire alarms. Mr Singh lied to court at the resultant enquiry, was charged with perjury and went to prison for thirty months. His landlord license was rightfully revoked. Despite this, on release from prison Harry Singh continued to rent out private properties in appalling conditions, operating without a license. This year he was found to be renting out fourteen properties, none of which met fire safety standards, risking the lives of his tenants and making a mockery of housing law and safety in Scotland. The collective repossessed the entire tenement block at 4 Queens Crescent to put to use for the benefit of the community. The demands of this political action were that Singh’s properties be repurposed from decaying buildings to vibrant spaces that would serve the neighbourhood and confront the housing crisis. The collective took the first step towards that end by demonstrating that we could take better care of the property and put it to better use. Today, on the 28th of September a representative of Singh called the police. The collective made the police aware of Singh’s history and the reasons for the protest. The police fully cooperated with the slum landlord, breaking down the front door and forcing the people inside to come out. The Police claim they were enforcing the Trespass Act 1865 (an archaic piece of legislation passed to criminalise highlanders resisting the Highland Clearances). Without a court order, we hold that this was illegal and in violation of our right to protest, as guaranteed by Articles 10 and 11 of the European Convention of Human Rights. Singh soon arrived in a luxury car, and as he received criticism from those assembled to support the protest, he was escorted by the police into the building. At a later point Singh brandished a length of wood at the protestors and he also grabbed one by the throat. We call on everyone to speak up and publicise these events. We also call on everyone to stay tuned for updates and to show their solidarity. There will be more information soon. Below is the statement the collective wrote to distribute to the local community. On 23rd September we, a collective of Glasgow tenants entered the empty property 4 Queens Crescent. 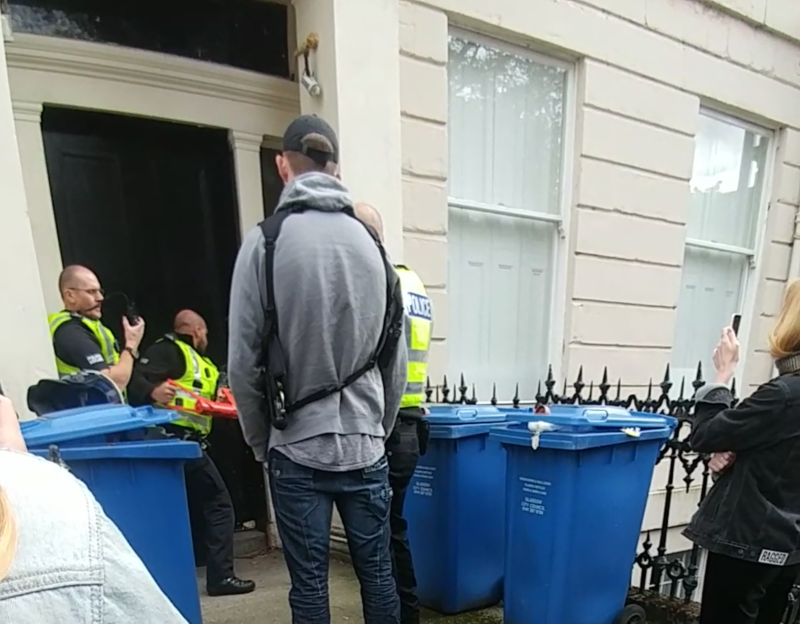 We did not break in, the external and internal doors were already open after the landlord illegally removed the locks to intimidate and evict his tenants. We are your neighbours and we will act with the utmost respect to this community. If you need a hand changing a light bulb or clearing a tree off the road (!) you know where we are. We are not here to lodge, hold parties, make any inconsiderate noise or interrupt any legal activity. We reject the exploitative relationship between renters and landlords. We strive for a society where safe and humane housing is protected as a fundamental right, above the interests of profit. We are here to call attention to the broken housing system in Glasgow and call for change from below. The space where we are protesting is the private property of Harry Singh. In 1999, two tenants died in a house fire at a property owned by Singh. The property was not equipped with working fire alarms. Mr Singh lied to court at the resultant enquiry, was charged with perjury and went to prison for thirty months. His landlord license was rightfully revoked. Despite this, on his release from prison Harry Singh continued to rent out private properties in appalling conditions operating without a license. This year he was found to be renting out fourteen properties, none of which met fire safety standards, risking the lives of his tenants and making a mockery of housing law and safety in Scotland. Mr. Singh’s case is representative of the wider landscape of the housing sector which is geared towards generating profits at the expense of people’s dignity. From 2010 to 2017, there has been a 19.9% cumulative increase in average monthly rents in Scotland. Meanwhile cases of damp, infestations and decay are worsening year on year. This is leaving us paying more for poorer housing conditions, forcing tenants to choose between food and heating, and worse, forcing people onto the street. The problem is not limited to Scotland. Last year the Grenfell fire led to the deaths of 71 people, victims of a housing system that values profit over people’s basic safety. This is a society where dignified housing is a privilege not a right. With this political action we intend to reclaim the property that has been the site of landlord harassment and neglect for so long and repurpose it. We are determined to make this space meaningful to local residents, organisations and the people left behind by the housing system. In this spirit, we will organise workshops, talks and community events that are open to all, focusing on the housing crisis and how we can change it, together. Housing is a human right, this is why we have to fight!